Should we climb the Beehive? My 11-year old son wanted to; my 9-year old daughter was game. But my husband and I weren’t too sure. We read the Acadia National Park’s book of hiking trails’ description. We talked to a ranger and examined her photographs. Through binoculars we watched from below as little bits of color moved along the edge of the mountain. We knew there were iron rungs and exposure, rocky ledges and an iron bridge. The kids insisted they could do it. We decided to go for it. 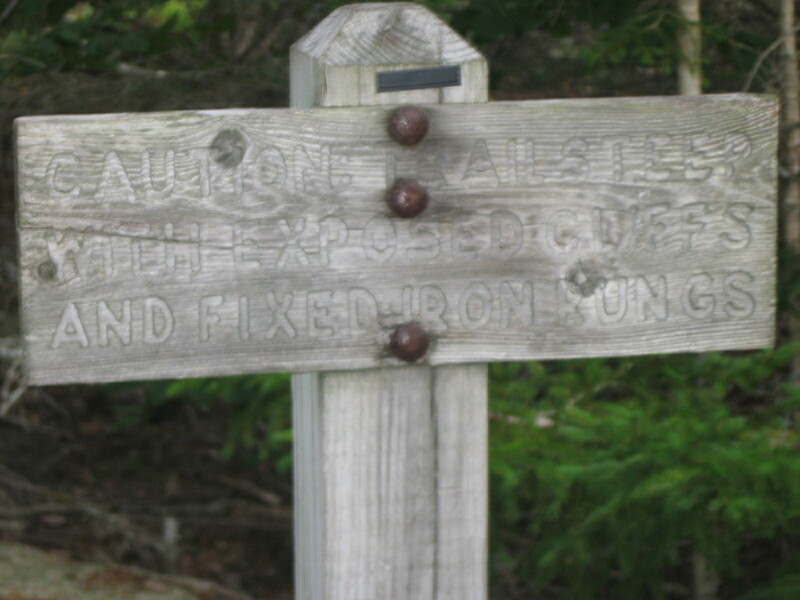 We began to walk up the trail, pausing to read the sign. “Caution!” it warned. My husband and I looked at each other. Were we doing the right thing? We took a photo of the sign and continued as the trail turned from an easy meander to rock scrambling, boulder stepping, and hand grasping. The trail wasn’t as bad as I had feared. I followed my son with my daughter behind me, occasionally catching glimpses of my husband’s worried face below. The kids were doing fine and seemed to enjoy the challenge of the mountain. 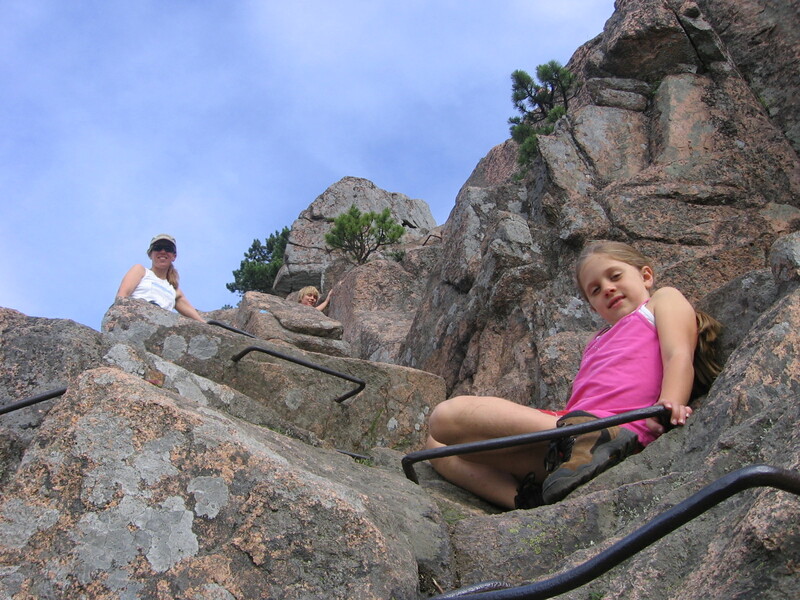 We crossed the narrow iron rung bridge climbing the iron rungs up the pink granite as we would a ladder. Only 30 minutes later, we stood at the top, ready to take our photo with the town newspaper, my husband visibly relieved that it was over, I amused that the elevation was only 542 feet. That evening, after more hiking, a walk out to some tide pools, and a lobster dinner, we stopped at our campground’s store for some ice cream. As we licked our ice cream, preparing to play a game of Uno, I noticed a laminated newspaper article posted on a map of Acadia on the store’s bulletin board. The headline read, “Man Dies In 200 Foot Fall Off Beehive.” We laughed knowing we never would have climbed the Beehive if we’d seen that article the night before. Hiking, Maine, National Parks, New England, U.S. The photo of you and the kids was taken from a great perspective. Sometimes it’s hard to capture the true steepness of scenery. And to let your kids climb this must have given them such a feeling of confidence and accomplishment! What a great experience. I loved the bit about the article you came across AFTER the climb! We are planning to visit Maine next year. Great post! Maybe we will try hiking the Beehive too! Question – what campground did you stay at while in the area? We stayed at Mount Desert Campground on a wooded tent site. We were disappointed at first that our site was not on the water, but soon discovered that the water sites, while beautiful, have no privacy at all. While our site was private, we could hear the road. The kids had fun catching crabs from the dock, and we all enjoyed the ice cream.